In Baltic Blue with a full cream leather interior. 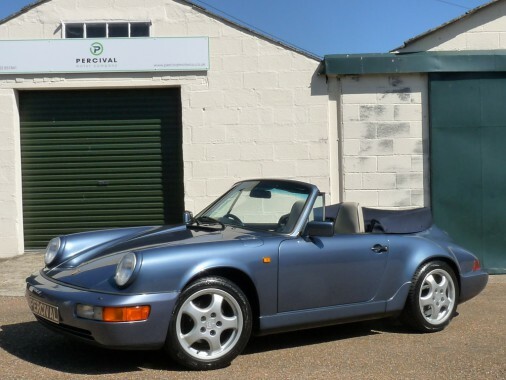 We sold this lovely looking 964 Cabriolet in 2016 to a long term customer of yours who has covered nearly 5,000 miles in it since. The Porsche has had light use with its caring owners for the last eleven years and has been known to us during that time. It has now covered 98,000 miles and comes with a full service history, including MOT certificates back to 1994, and the original Dealer Pack with all the books. The car has been looked after by Paragon Porsche in recent times and has had a thorough service, a front suspension rebuild and geometry check and various other works totalling £5,000 during the last two years. It is mechanically superb. This is a Carrera 2 version with a 250 bhp six cylinder engine with two wheel drive. The specification includes a five speed manual gearbox, a fully electric roof with a tonneau cover in blue, cream leather Sports seats piped blue, power steering, Cup 2 alloy wheels and a Thatcham Cat 1 alarm. It has wind deflector fitted. The bodywork is very good with no deterioration and even panel gaps throughout. The interior, rare with full leather in cream, is excellent with just some light wear on the driver's seat bolster. The hood has recently received an new inner headlining.